Admit it – you came to Italy to eat. And obviously, pizza is on your culinary bucket list. But before you go forth and order some hot and delicious pizza in Rome, Naples or Florence, read this first. Going in unprepared might lead a lot of questions. For example, why is the man behind the pizza counter taking out scissors? Don’t worry, it happens to everyone on their first attempt at ordering pizza in Italy. Read on and you’ll do just fine. In all of Italy and in most of the world, margherita pizza is number one. The original pizza was first made in Naples and then shared throughout the major cities of Italy. Eventually, it became the basis of pizza everywhere. Made with homemade dough baked from simple, fresh ingredients, fresh tomato sauce, olive oil and fresh mozzarella, you can’t go wrong with a margherita pizza. 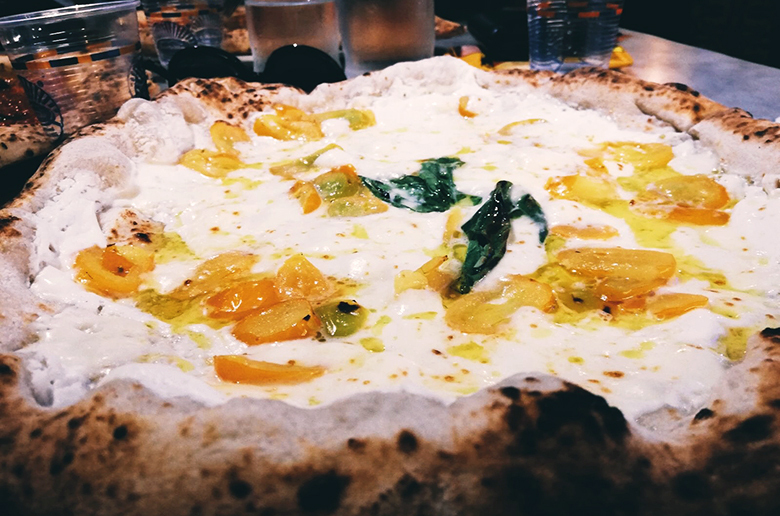 In Naples, stop at Pizzeria Da Attilio to indulge in a true neapolitan margherita pizza. Many Italians consider the margherita pizza the only true kind of “pizza” because less is more when it comes to tasting the simple and fresh ingredients. Also, unlike in most other countries, everyone gets their own pizza in Italy. Don’t expect to share with your friends in this case. There are two ways to enjoy pizza in Italy. Either sit down in a restaurant and order a pizza pie, or go to a pizzeria and get pizza al taglio (cut to-go). The Italian version of fast food, pizza al taglio is a popular way to grab a bite to eat for lunch. When ordering pizza al taglio you walk up to a counter where you’ll find several types of long square pizzas – usually at least five types with various toppings. There’s usually even pizza without cheese (pizza rossa) if you prefer to forgo the dairy. Tell the person behind the counter which kind of pizza you want. Just point to the slab that appeals to you and use your hands to indicate how big you want your slice. Then, the pizzaiolo weighs it and charges you. That’s right, pizza al taglio’s price changes by weight like meat or produce in a grocery store. So, the more pizza you ask for, the more you’ll pay. You can either try one large piece of the same type or smaller slices with varying toppings. If you’re visiting Rome, Dar Poeta Alla Scala in Trastevere is an excellent spot to grab some pizza al taglio – try the amatriciana kind. Made with prosciutto and pecorino romano cheese, amatriciana is the perfect blend of salty and savory. Ristorante a Casa Mia, also in the charming Trastevere neighborhood, makes a pizza called parmigiana di melanzane (eggplant parmesan). The eggplant is slightly crispy but also soft like butter in the center – a slice of this pizza takes your lucky tastebuds for a whirl. Plus, eating pizza with a vegetable on it means it’s healthy, right? Da Vittorio a Trastevere serves up with an adventurous twist. At this pizzeria, partake in a spicy pizza challenge by sampling something called the “Tre Colori Pizza”. Green, red and white like the Italian flag, try not to let the pizza burn your mouth with it’s jalapeno peppers (doused in jalapeno sauce), spicy Sicilian sausage and spicy white cheese. If you finish the entire pizza in 10 minutes or less, with only 16 ounces of water or a beer to help, you win a prize. As the victor of the contest, your meal is free plus you get a second large beer, a commemorative t-shirt and your picture posted on the wall of fame. If you don’t succeed, you’re only out a mere 10 euros. Simply try, try again! Picture yourself sitting down in a cozy sit-down restaurant after a long day of sightseeing. You’re famished, and the smells emanating from the wood-fired oven are making you salivate. The waiter heads your way with a beautiful margherita pizza in hand. He puts it in front of you and you notice that it isn’t sliced, what now? Italians eat pizza with a fork and knife. The first is that pizza is to be enjoyed straight from the oven and piping hot. Waiting for your dinner to cool down is just not an option – protocol says it should be enjoyed straight away. Therefore, if you grab a hot slice you’re begging for a burn. Just cut it up with the knife and fork and spare yourself the inevitable pain. When eating pizza in Italy it’s hard to go wrong. Whether you grab a slice al taglio and eat it by a fountain in a pretty piazza or you sit down in a cozy trattoria, you’re eating pizza in Italy and that’s all that matters. And remember, pizza is a social food. While you’re savoring each delectable bite, appreciate your travel companions and all the people around you. You’re all in this together. Buon Appetito! Are you looking for even more foodie spots? Check out the best places to eat in Trastevere and the Vatican! Check out this list of Piazzas in Rome for a nice pizza by the slice! Or do you want us to take care of your foodie stops during your Italy trip?! Have a look at our small group Italy food tours! I grew up in an Italian-American family (pay no attention to my last name) and fell in love with Italy on a family vacation. I then studied in Rome in college and fell deeper in love with Italy. Now I enjoy the opportunity to share my love of Italy with others. Hello! Thank you for the great article – any chance you could provide the name of the restaurante where the white pizza under the title of the article is? Ciao Vernoica! Glad you enjoyed the article. Sure! It’s Sorbillo in Naples. If you’re looking for a similar pizza in Rome, try Pizzeria da Michele. And, if you’re looking to try some amazing pizza while in Italy, check out our delicious local foodie tour in Trastevere. It’s incredible!